Two nice towns. Our tour guide/driver was Tiago--a great guy who truly cared about us having a good time. Be warned, however, that the tour does not include a trip inside the library in Coimbra--very disappointing. Aveiro along the beach front with the small, colorful houses was the highlight of the trip. Tiago was a great guide. He is fluent in English, knowledgeable not only in the history, economy and political environment of Portugal but also current world events. He is genuinely friendly an kept us entertained with information of the country and the places we visited. We visited Coimbra in the cooler part of the morning with a boat ride and a great lunch at a local restaurant of Tiago's recommendation. We finished the tour with a visit to the beach at Aveiro and enjoyed the cool breeze and the beautiful beach by the Atlantic. Our guide Hélio picked us up from our hotel and drove us to the beautiful city of Aveiro Portugal's answer to Venice where we took a boat tour and viewed the wonderful fishing houses. In contrast to this sleepy seaside area, we were then taken to the historic city of Coimbra, a place that reminded me much of Bath, my old place of residence in the UK. Here we went up to the prestigious university, which we learned inspired aspects of Hogwarts in the Harry Potter series, and then further explored the medieval city. Throughout the trip Hélio gave us an extensive and interesting history of both locations, and how this related to the larger history of Portugal. Not only a great story-teller, Hélio had an impressive wealth of knowledge, and answered our questions well, and his enthusiasm was infectious. In addition to this he was flexible, adapting the tour to your preferences, punctual to the minute and the best at parking I have ever seen! If you are interested in getting to know more about Portuguese culture and history outside of Porto, this is the tour for you. It was great to visit Aveiro and Coimbra was stunning. However, I was quite surprised that we had to pay for entrance fees. I would have thought these would have been included on such a tour. Our guide, Helio, arrived not only on-time, but was already in front of our hotel when we got there a few minutes early. He introduced himself, got us situated and immediately started to tell us about the history and background of where we were headed. As this was a small/private type tour, we could decide on the amount of time we wanted to spend at each location. 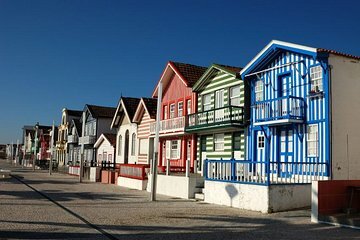 We enjoyed the cute colorful houses at Costa Nova and the canals of Aveiro. Our guide introduced us to the local dessert and even treated us each to one. But the highlight is the background provided by our guide, which really helped us appreciate the importance of these places in the history of Portugal. After eating a nice meal at a recommended restaurant, we headed toward Coimbra. Helio knew we wanted to visit the university so he called ahead to book us the entrance tickets so we could skip the lines And the tickets were included as part of the tour. He showed us where to start our tour and let us explore at will. Then he took us to Old Town Coimbra where we visited the Church of Santa Cruz and strolled around. We know there are more sites to see in Aveiro and Coimbra, but we saw everything we wanted to. Helio was willing to give us as much time as we wanted at every location. He was courteous and personable, making sure the tour was customized to our expectations and that we didnt miss any important facts/sites. There were things I wouldn't I have noticed if he didn't point them out. He is curious about people and also shares about himself. We love it when our guides are passionate about their home country as Helio is. Overall, this was an excellent tour and we learned a lot. My family would definitely recommend this tour. Our guide was very good and we enjoyed both places - Coimbra is a must - the university is outstanding as is the library in the university. We would have liked to have spent more time in the city centre of Coimbra and have had lunch there instead of a restaurant which was too far from the city center and took up a lot of time. We had a wonderful time. The guides were helpful and full of information on the region. Went beyond expectations to make the tour an enjoyable experience. Would do it again.